Yeah, I know, right? What are you saying, Jess? Everyone knows that home-cooked meals are the bees knees; they’re full of family love and old-school ingredients, and your favourite Swiss herb salt. But, can I just say something? No, they’re not that good. And I’m going to explain this to you by telling you The Wok Story. Last night, I dreamt about eating a stir-fry. It was a powerful and delicious dream, and I woke up thinking “MAN I need to get a bit of that crunchy snowpea, that flowery broccoli, that floppy choy sum, inna my grill right now”. 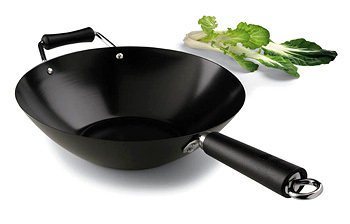 The problem was, our house doesn’t have a wok right now, ever since I chucked out the old wok that was flaking off pieces of non-stick teflon in amongst your food, so it looked like you were serving up a little toxic ant farm every time you decided to cook a sneaky bowl of Asian greens. I decided there was one thing to do, and that was to BUY A WOK and to MAKE MY STIRFRY and then maybe have a well-deserved WEEK-DAY NAP. I took my housemate Edmund as a Culinary Advisor and Umbrella Carrier, and we found a homewares shop with a hopeful salesperson who directed his entire sales pitch at Edmund, and not me, which should have been the first warning signal. Non-stick future-flakey toxic antfarm woks. Carbon steel woks are the woks that you need to basically put through 12 years of intensive private schooling (also known as: preparation and seasoning) before they’re ready to finally graduate (also known as: cook you a fricken stir-fry). The wok I finally bought was a carbon steel wok; it needed about 50 minutes of solid emotional care-giving and ego-massage before it could even think about letting me fill it with my favourite tofu and gai lan. First, you had to pretty much bake a plastic layer of coating off the wok. Then you had to scrub the softened plastic layer off the wok with a scourer. Then you had to heat up oil in the wok and let it smoke and then let it cool down, and then wipe off the oil and then do that again THREE MORE TIMES. I’m sorry: NO. The stir-fry was not worth this. Mainly, because of the fear that I hadn’t properly baked off the invisible-plastic coating and was therefore eating a tasty bowl of Asian greens sautéed in a toxic broth of SMOKED PLASTIC, which is probably even more of a carcinogenic than teflon shavings. And yes, the stirfry was delicious, but you know what’s more delicious? Not being poisoned.